The Global Volcanism Program has no Bulletin Reports available for Sakar. Sakar is an incised stratovolcano with a summit crater lake. Deep valleys cut the flanks of the volcano, which is partially surrounded by coral reefs. An older volcano that forms much of the island consists mainly of porphyritic basaltic rocks. A younger andesitic cone with a 1.5-km-wide crater has been constructed within the older volcano's larger crater, whose rim is exposed on the northern and eastern sides. No historical eruptions are known from Sakar, but warm springs are found along the SW coast, and a pyroclastic cone on the southern flank of the 8 x 10 km wide island may be of Holocene age (Johnson 1990, pers. comm.). A large submarine debris-avalanche deposit lies north of Sakar. Johnson R W, Taylor G A M, Davies R A, 1972. Geology and petrology of Quaternary volcanic islands off the north coast of New Guinea. Aust Bur Min Resour Geol Geophys Rec, 1972/21: 1-127. Lowenstein P L, 1982. Problems of volcanic hazards in Papua New Guinea. Geol Surv Papua New Guinea Rpt, 82/7: 1-62. The Global Volcanism Program is not aware of any Holocene eruptions from Sakar. If this volcano has had large eruptions (VEI >= 4) prior to 10,000 years ago, information might be found on the Sakar page in the LaMEVE (Large Magnitude Explosive Volcanic Eruptions) database, a part of the Volcano Global Risk Identification and Analysis Project (VOGRIPA). There is no Deformation History data available for Sakar. There is no Emissions History data available for Sakar. 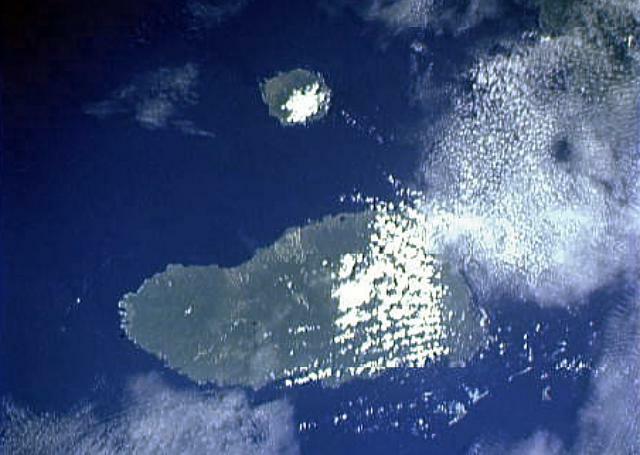 The small circular island at the top-center is Sakar, the NE-most of a chain of volcanic islands off the northern coast of Papua New Guinea. The 8 x 10 km wide island, seen in this Space Shuttle image with north to the upper left, is an incised stratovolcano with a summit crater lake. No historical eruptions are known from Sakar, but a pyroclastic cone on the southern flank of the volcano may be of Holocene age. The 50-km-wide island of Umboi, whose left side is cut by a large caldera breached to the NE, fills the center of the image. NASA Space Shuttle image STS50-100-D, 1992 (http://eol.jsc.nasa.gov/). There are no samples for Sakar in the Smithsonian's NMNH Department of Mineral Sciences Rock and Ore collection. Large Eruptions of Sakar Information about large Quaternary eruptions (VEI >= 4) is cataloged in the Large Magnitude Explosive Volcanic Eruptions (LaMEVE) database of the Volcano Global Risk Identification and Analysis Project (VOGRIPA).